Location : In the old city area just a Kilometer North to Itmad-ud-daula. Ideal Time to Visit : Anytime round the year. Attraction : Embroidery work on facets. How to Reach : Hire a cab or Auto from the hotel. Chini-ka-Rauza is considered a milestone in Indo-Persian architecture, as it is the very first building in India that has been exclusively decorated by the glazed tile works. The decoration is prominent on façade and exteriors. Chini-ka-Rauza is actually a small mausoleum that overlooks the River Yamuna. The tomb is a fine architectural example of pure and undiluted Persian architecture. This is a tomb to Mir Afzal Khan, a senior Wazir or minister in the court of Shah Jahan. Afzal Khan was actually a resident of Shiraz in the then Persia who migrated to India on the invitation of Shah Jahan. He was actually a poet-scholar who later rose to the post of Wazir-e-Ala i.e. Prime Minister in the reign of Shah Jahan. The man himself constructed Chini-ka-Rauza. 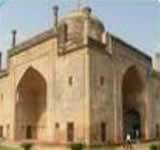 The name is derived from two Persian words Chini Mitti and Rauza that means glazed tiles and tomb respectively. Built in 1635, Chini-ka-Rauza is situated just a Kilometer North to the famous Itmad-ud-Daula on the same side of Yamuna but is in dire straits due to negligence. Though it does not match the charm of Itmad-ud-daula, its importance as being the only pure Persian architecture in India, makes it worth preserving. Parts of the walls are still covered with the colored enamel tiles that once enhanced the whole of the exterior and gave the tomb its name, while traces of paintings and Islamic calligraphy can still be made out on the high domed ceiling. On the top of the chamber are inscribed some Quranic verses. Although it is in a dilapidated condition, but still its craftsmanship is worth seeing.